Yes please! I have the driest feet and need a pedi BAD. I WOULD LOVE to try this out! Thank you! My feet dry out so bad they crack,ive tried all kinds of creams.would love one that actually worked! Oh my heels are horrid! I've been using a Ped Egg but they need some serious help that this might just provide. Thanks! I need something to help my feet. It seems they get neglected the most! I have very dry feet, esp. heels. I'd love to try it because I have super dry skin. My feet are a mess-this would be great! I also have dry, cracked feet since I prefer to go barefoot around the house. Would love to try this cream you've had such good results with. I wear heels all the time and feet are NOT pretty!! I always have to put tons of lotion on my feet to keep them from drying out throughout the day. I think this cream would be great for me. Like you said, it's flip flop season :) Thanks! I get scaly nasty elbows in the winter. OK, I don't like it, but I can hide it. BUT, for some reason, I have them now - in the summer! I can't hide them and nothing I've tried has helped. I'd love to give this stuff a try. I'm a brand-new follower via GFC ((1955nursehjc4me(at)myway(dot)com)) Thanks! My skin is in terrible shape from the winter and I'm going to sunny CA in a few weeks. I would love this. Thanks. Dawn sent me. (extra entry from FB. Liked this post on FB with the button. Stumbled this post as lewalk. I'd like to try it to help w/ my really dry skin. 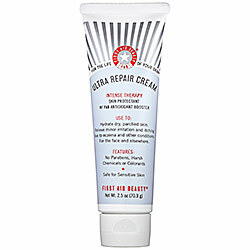 -I would love to have this cream because I suffer from severely dry skin, which I think this could help! I would love to win this for my wife. She takes car of myself and our four kids. She deserves it. Thank you for the chance. I would love to try this because my feet and hands get dry. I would love to win this because it is not greasy. I use a lot of lotions and most are greasy! I have very dry skin and would love a good non greasy lotion.! I like that this cream is not greasy.